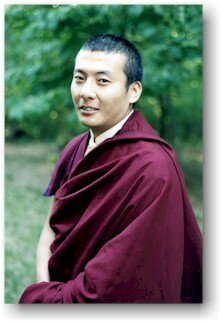 Luding Khen Rinpoche (Tib. ཀླུ་སྡིངས་མཁན་རིན་པོ་ཆེ་, Wyl. klu sdings mkhan rin po che) is the 76th abbot of Ngor Monastery of the Sakya school and head of the Ngor subschool. He succeeds to his uncle, Luding Khenchen Rinpoche. His mother is Jetsün Kushok Chimey Luding, the sister of His Holiness Sakya Trizin, and his father is Sei Kushog, the brother of the senior abbot of Ngor Monastery in India. As a child, Luding Khen Rinpoche was selected to be trained as the successor to the abbot of the Ngor Monastery and was sent to Ngor monastery in Manduwala, India to undergo the rigorous training that is a prerequisite for lineage holders. He also received many teachings and empowerments directly from His Holiness the Sakya Trizin. Having completed his training as successor to headship of Ngor Monastery in March, 2000, Luding Khen Rinpoche was enthroned as abbot. This page was last edited on 24 March 2018, at 21:22.